All paper floor tape begins its life as white tape. Flatback paper (the backing for Shurtape 724 and other smooth paper tapes is made from bleached paper stock and it gets its base color as part of the manufacturing process. Demand for white is much higher than other colors, particularly since the primary use for this product is for printed labels. Colors are added in a separate dyeing process and this extra step and additional material has an impact on the cost. 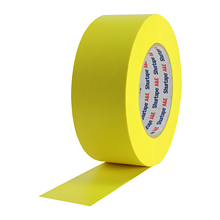 Shurtape 724 is available in five colors, each of which has to go thru its own individual dyeing process. Neon colored paper tapes like Pro Tapes Artist Tape has a different dyeing process which gives those tapes the ability to glow under black light.